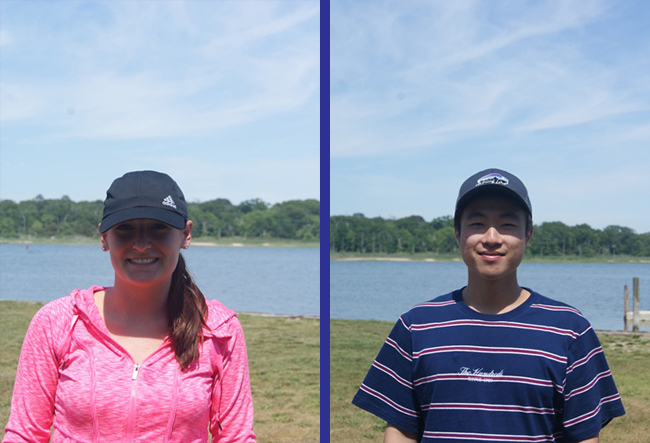 Stony Brook, NY, June 2, 2018 - Five interns are being supported through New York Sea Grant's "Fish to Dish Internship Program" this summer. Sea Grant's aim is to aid in the development of a skilled student workforce capable of advancing and working in the industry in the future. 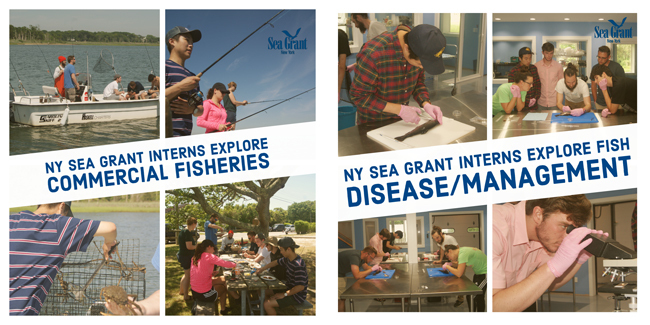 The program, which is funded by the National Oceanic and Atmospheric Administration’s National Sea Grant Program, introduces students to an industry with exceptional growth potential and empowers students to pursue careers in Seafood Science and Aquaculture. During their two months of on-the-job experience, the interns will, on Sunday July 15th, table at Columbia Sunday Greenmarket, New York City-based farmers market highlighting local products. 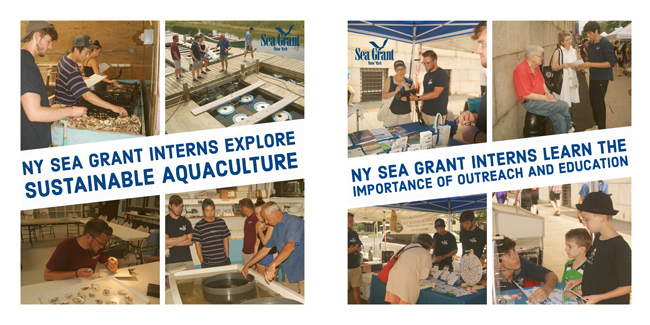 Also, on July 29th, there will be a showcase at the Long Island Aquarium in Riverhead during which the interns will have posters on display that illustrate their experience and seafood production in New York. Key to the success of this internship program is the direct industry support it receives, with interns working with industry partners during the summer months (this is outlined below). 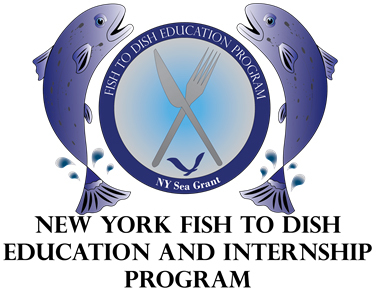 Each intern receives hands on training in his/her assigned sector of the seafood and aquaculture industry and obtains a "Fish to Dish" education on the industry as a whole. Industry Partner Internship at: Haskell’s Seafood, Fisherman and seafood processor based out of Calverton, NY. Haskell’s Seafood is committed to bringing the bounties and seasonal seafood harvests of the North Atlantic right to your front door. Focusing on small batches and sustainable fishing methods, Haskell’s Seafood takes every step to create an incredible seafood experience for the consumer. It all begins with their approach to handling fresh caught seafood. They minimize the transportation and handling by transporting the seafood under ice to their pristine facility within hours of harvest. Once a small batch of seafood arrives, it is trimmed, prepared, and portioned in an immaculate and boutique process before being marketed directly to the consumer. "Having no prior experience in seafood, fishing or aquaculture, this program has taught me so much about the industry and its desperate need to move toward integration between the different sectors," says Burke. "Haskells Seafood, specifically, has impressed me with its continuous effort to be as sustainable as they possibly can and make use of species that are typically underutilized. This experience has definitely changed my future plans and encouraged me to look into a future in food science with regards to seafood, aquaculture and fish feed." Industry Partner Internship at: Hudson Valley Fish Farms (HVFF), Indoor recirculating Fish Farm located in Hudson, NY. Hudson Valley Fish Farms is a Best Aquaculture Practices (BAP) certified fully recirculating fish farm raising steelhead (Oncorhynchus mykiss) in the Hudson Valley. 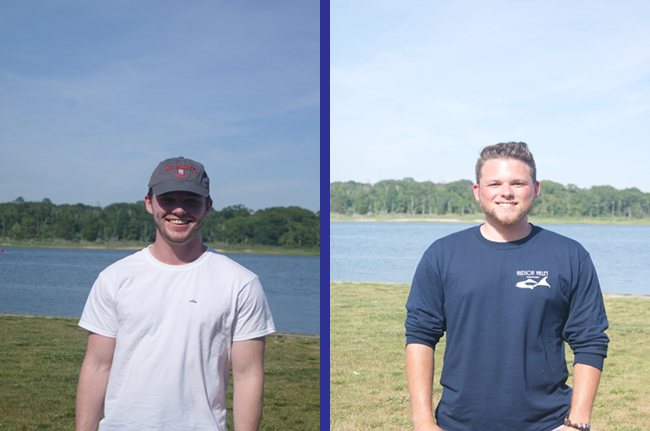 Interns gain valuable hands-on experience in the aquaculture industry while performing the duties of a recirculating aquaculture system (RAS) technician, including water quality analysis, animal husbandry, as well as care and general maintenance of the system itself. Interns learn about the practical side of fish health and welfare while assisting with regular health checks and product quality screenings. "I’ve learned a considerable amount about the details of the seafood industry, including a great deal about the logistics and planning in bringing safe/fresh seafood from aquaculture facilities and fisheries to consumers," says Chon. "At HVFF, I've been given the opportunity to be a part of a fully operational RAS site. Before coming into the program, I was not aware of all the work and care it takes to bring seafood sustainability to consumers. The program has deepened my interest in working in the industry and motivated me to be on the forefront of the team of biologists and seafood specialists to make seafood sustainable for the future. I now have a new outlook on the on importance of sustaining seafood for a growing population." Industry Partner Internship at: Acme Smoked fish, Largest smoked seafood processor in the U.S., based in Brooklyn, NY. Acme Smoked Fish Corporation has a long history dating back to 1906. Today Acme represents one of the largest producers of smoked seafood products in the U.S., producing over 300 different smoked seafood products. Acme Smoked Fish Corporation is dedicated to producing the highest quality smoked seafood items. Through continued membership in professional organizations and close work with leading academic institutions, they maintain their processes and procedures over and above industry standards. Acme’s superior standards ensure only the safest and highest quality products are produced. 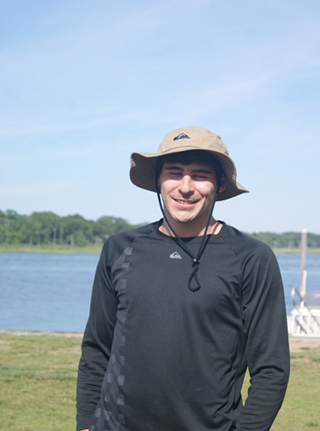 "In the internship so far I have had the opportunity to see seafood at most stages from fish-to-dish," says Eddy. "I believe it was very valuable to be able to interact with so many industry professionals so that I could better understand the challenges that they face from day to day. Likewise, I believe it was tremendously useful to see the ways that industry professionals interact with the market. I feel that I am much more prepared to enter into the seafood industry." Industry Partner Internship at: Great Atlantic Shellfish Farms, Shellfish hatchery producing hardshell clams, softshell clams and oysters in Islip, NY. After 26 years of shellfish production the Town of Islip Hatchery was closed following the devastation of Super Storm Sandy. In 2014, the hatchery and surrounding property were put up for lease by the town. Shortly after Doug and Kerry Winter won the bid and started making repairs to the facility. In the summer of 2014 the hatchery was brought back to full operation as the Great Atlantic Shellfish Farms, LLC. The farm produces and sells hard shell clams, soft shell clams, and oysters. "I have learned an in depth and extensive amount about shellfish and their life cycle and production, which is something I knew nothing about beforehand," says Pluschau. "I have for a while been very unsure of where I would like my career and future to go, and I would have never even thought to consider getting involved in seafood. I simply took a chance and applied and was accepted to this internship. I didn’t know too much about … and now I am seriously considering opening and running my own shellfish hatchery and farm in the future." Industry Partner Internship at: Manna Fish Farms, Off-shore marine Integrated Multi Trophic Aquaculture farm start-up located in Southampton, NY. Manna Fish Farms is on course to be the first open ocean finfish farm in Federal waters off the East Coast of the United States. Utilizing submersible cage technology, Manna Fish Farms will build and operate a commercial fish farm, growing finfish and researching IMTA (Integrated Multi-trophic Aquaculture) with macroalgae (kelp) and shellfish (sea scallops). Manna Fish Farms will use world proven submersible cage and automated feed technologies to grow local, wild species of finfish. The proposed 1.5 square mile site is located eight miles off the coast of Eastern Long Island. "To say the least, I have found this program beyond informative and a true delight," says Tobin. "The occurrence of the course on Sunday, while detrimental to a full weekend, allow me to maximize my work weekly. Additionally, throughout these short couple of weeks, I have gained more knowledge about both safe seafood handling and aquaculture then all of my other experiences combined; formal Cornell education included. Every trip provides new and profound information regarding the topic of choice and presents the material in a pleasurable and informative method." "The instructors, both more than competent while providing different perspectives, were able to keep the information interesting. While not surprised this course has shifted my long term aspirations, I now unquestionably aspire to work in the industry. Thank you again for everything. I am deeply appreciative and will always remember this course as a pivotal turning point in my life."